You guys…it’s December already. How is this possible?!? It feels like yesterday was just Halloween, no joke. I guess time really does fly when you’re having fun does it not? At least that’s what I’ve heard. Speaking of fun! Besides these seriously DELICIOUS donuts, and that term is not used lovely here I have some more fun to share with you! How about a giveaway?!?! What perfect timing , just in time for Christmas. Who doesn’t love free stuff this time of year? Well this giveaway is from World Vision Gift Catalog. If you’ve never hear of World Vision before they are a Christian humanitarian organization helping children, families, and their communities overcome poverty and injustice through child sponsorship, clean water, health, education, child protection, and economic development. 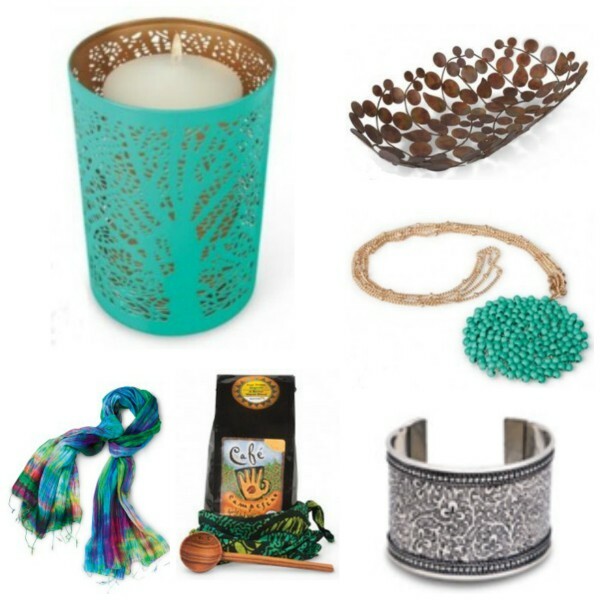 The beautiful handcrafted gifts that are included in the amazing giveaway are – Tree of Life Votive Holder, Upcycled Artisan Bowl, History’s First Coffee Blend, Turquoise Medallion Necklace, Royal Silk Scarf and Silver Vines Cuff. To learn more or donate to World Vision swing by here to find out how! 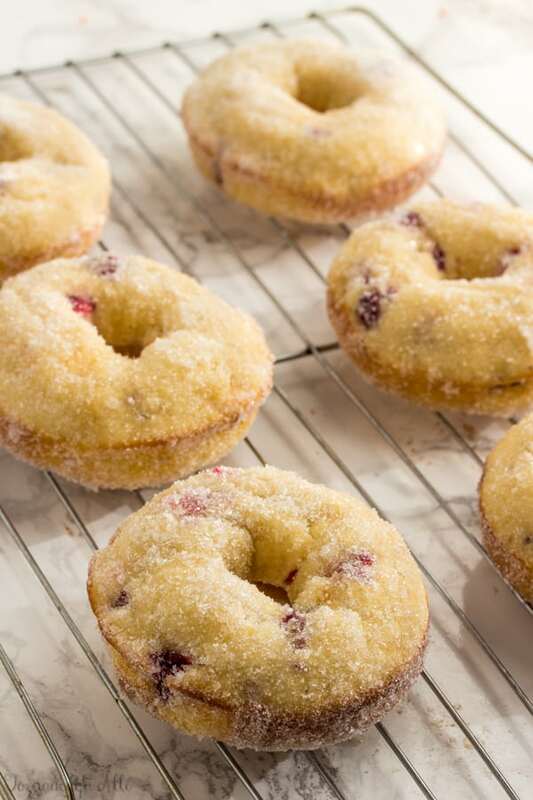 OK how about we talk about these delicious Cranberry Bliss Donuts shall we?! I’ve always been a huge donut lover you can check out some of my previous flavors here ——> S’mores, Banana Caramel Macchiato, Strawberry Lime….the list goes on. If you’ve ever been to Starbucks and tried their Cranberry Bliss Bars, these are based off of those flavors. I’ve never actually tried an original one, but I’ve made the copycat recipe and I was hooked!! And I figured what flavors would be more perfect for the holidays than cranberry and white chocolate? And you wanna know what?! I got these cranberries for a STEAL!! Literally .98 cents for a whole bag! I was sooooo happy. I could be making donuts for ever with that price. But in reality I used some of these cranberries to go in these delicious Cranberry Orange Mojitos, another fun festive idea for this holiday season! Ok, I have to admit….usually I like my donuts glazed, frosted or something. But when I decided that I wanted to just sugar these puppies, I think it was one of the best decisions I’ve ever made. It’s kinda of like one giant sugared cranberry so to speak. 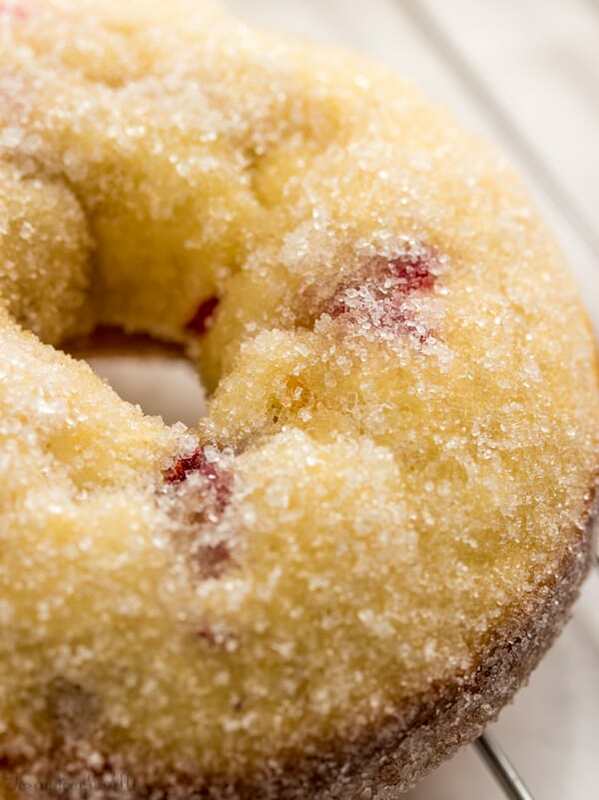 Except that cranberry is baking into a donut along with white chocolate chips. Hella good my friends. 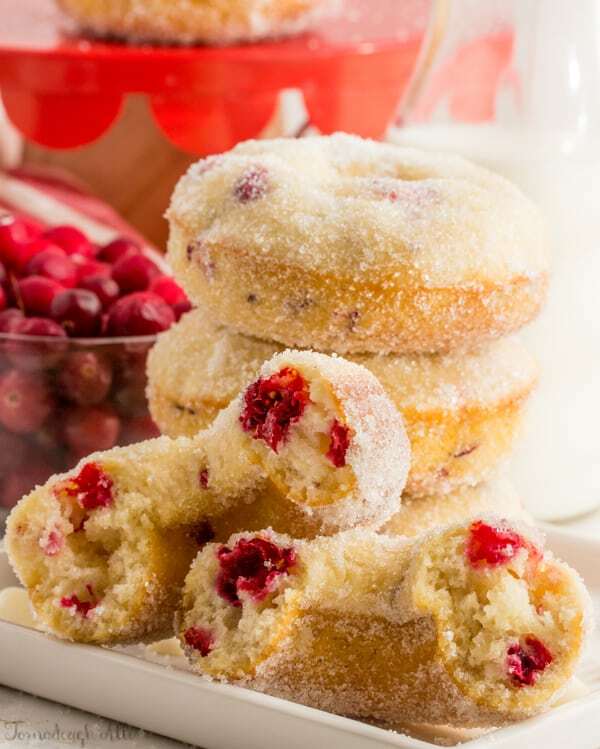 So if you want a fun, seasonal, quick and addicting breakfast or dessert this time of year I highly recommend that you give these Cranberry Bliss Donuts a try, you wont be sorry…I promise! World Vision sent me a box of some of their amazing items to try from their website and catalog. They have also provided these same items for a giveaway to my readers. 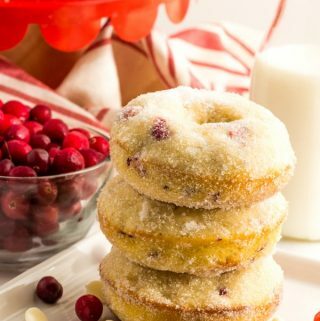 Cranberries and white chocolate chips are baked into a delicious donut and coated in sugar for the perfect holiday breakfast. In bowl mix together your dry ingredients and stir to combine. Add your egg, sour cream, milk, 1 Tbs butter and vanilla extract and stir until just combined. 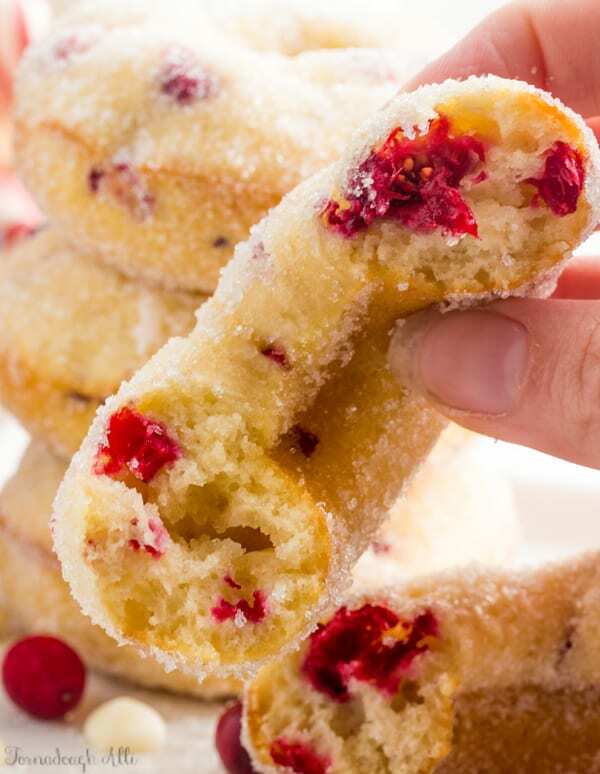 Fold in your cranberries and white chocolate chips. 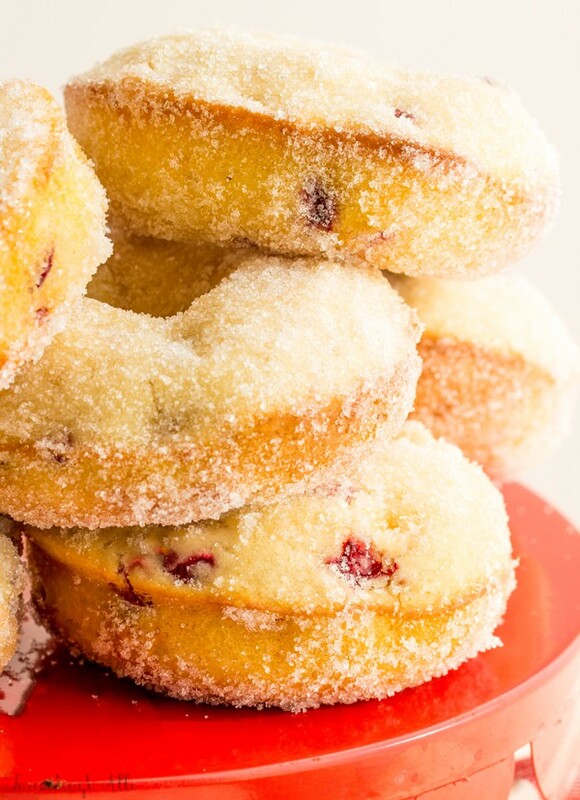 Spray your donut pan with non-stick cooking spray and pipe or spoon your donut batter into wells. Bake for about 10 minutes or until golden and springs back when touched. Remove from oven and turn out onto cooling rack, let cool until able to handle. 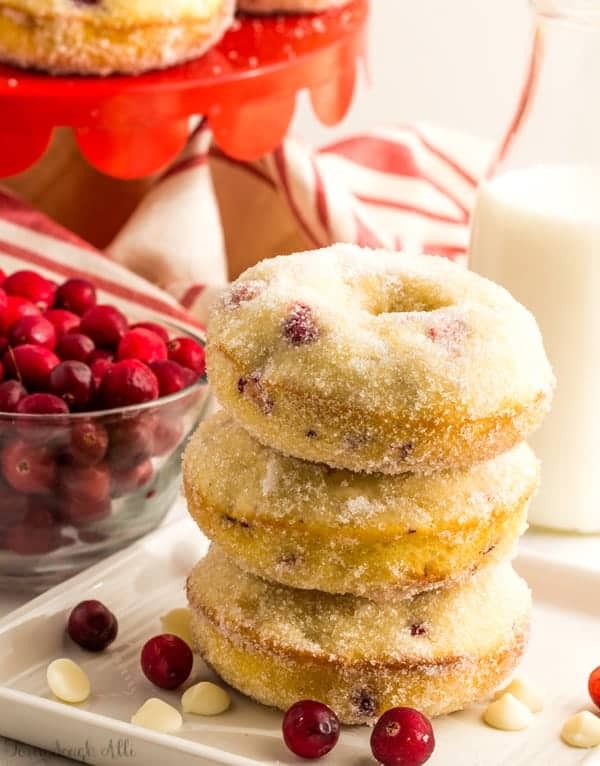 Brush each donut with remaining melted butter and toss in sugar. Oh my gosh, my stomach is rumbling now! I have to make these, they look amazing! My grandkids will love making these donuts. Thanks so much for the giveaway, everything is so unique. These just scream Christmas to me. I stocked up on cranberries since they were on sale, and now I know what I’m doing with them!! One of these days I’m gonna have to have you make me some goodies! I don’t have the knack for baking like you do! This recipe looks so delicious. I am excited about all the items in the giveaway I really like the necklace. What a great basket of goodies, and for a good cause! Of course I love all things donuts so you got me all the way around! I’m excited by both your recipe AND the gift basket – love all of the turquoise!!!!!! I love it all! That necklace is pretty fantastic.